Ian Folivor (Adrian DiGiovanni), a depressed and reclusive thirty-something, finds himself taking advice from a growth in his bathroom after a failed suicide attempt. 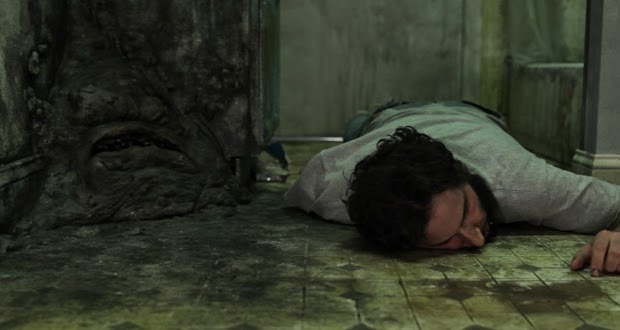 The Mold (Jeffrey Combs), a smooth talking fungus who was born of the filth collecting in a corner of Ian's neglected bathroom, works to win Ian's trust by helping him clean himself up and remodel his lifestyle. It takes balls to set an entire movie in one squalid, cruddy location as writer/director Don Thacker has done with Motivational Growth. It takes even more nerve to have the movie's narrative revolve around a depressive young man and a pile of sentient bathroom filth. Motivational Growth would seem to have the deck stacked against it from the outset, but it grows on you anyway. Clearly, Mr. Thacker is not a man with whom to trifle. The most obvious lure here is the above-the-title involvement of genre icon Jeffrey Combs (Re-Animator, From Beyond) as the voice of the aforementioned sentient bathroom filth that calls itself The Mold - and don't you dare omit that article! Combs instills a generous amount of life into the oozing pile of puppetry representing The Mold, but he is by no means the movie's only selling point. That fact alone is surprising, but not quite as surprising as the movie's real strength. Motivational Growth is gross, funny, and disturbing, but it also has a lot of heart. Ian Foliver (Adrian DiGiovanni) hasn't left his ratty little apartment for months, and he's also working on a raging case of agoraphobia. He's surrounded by heaps of trash and detritus, and he spends so much time sitting in front of his old console television - which he affectionately calls Kent - that he's developed bedsores. He seems a decent enough guy, though, and DiGiovanni's performance makes the character far more interesting and sympathetic than one might expect. Ian frequently breaks the fourth wall and addresses the viewer directly, one of many stylistic gambits that forges a deep and empathetic connection with the viewer. After a failed attempt at suicide Ian takes a nasty tumble in the bathroom, and when he comes to he discovers he's not alone. There's a lumpy, green pile of talking fungus in a corner of the bathroom that introduces itself as The Mold and assures Ian - whom he insists upon addressing as Jack - that he has a "plan" for him. The Mold intends to rehabilitate Ian. Thanks to The Mold's help, Ian even ultimately meets - in his own doorway, natch - his lovely young neighbor Leah (a sweet and appealing Danielle Doetsch) whom he's been harmlessly stalking via the peephole in his front door. Of course, there's more to The Mold's "plan" for Ian than is immediately evident, and the moderately rehabilitated Ian begins to question The Mold's motives. Perhaps The Mold isn't as altruistic as it at first seems? Motivational Growth almost immediately begs comparison to the darkly comedic and twisted filmography of Frank Henenlotter (Basket Case, Frankenhooker). In particular, one can't help but be reminded of Henenlotter's thematically similar Brain Damage (1988). Both movies revolve around a troubled but sympathetic protagonist being manipulated by a "mentor" with questionable motivations, and in both cases, that mentor takes the form of an unnatural visitor depicted onscreen by a latex puppet. The Mold could easily take its place alongside Aylmer from Brain Damage or Belial from Basket Case in Henenlotter's rogues gallery of practical FX driven oddities. Motivational Growth possesses the same grotty grindhouse aesthetic commonly associated with Henenlotter's work, as well. 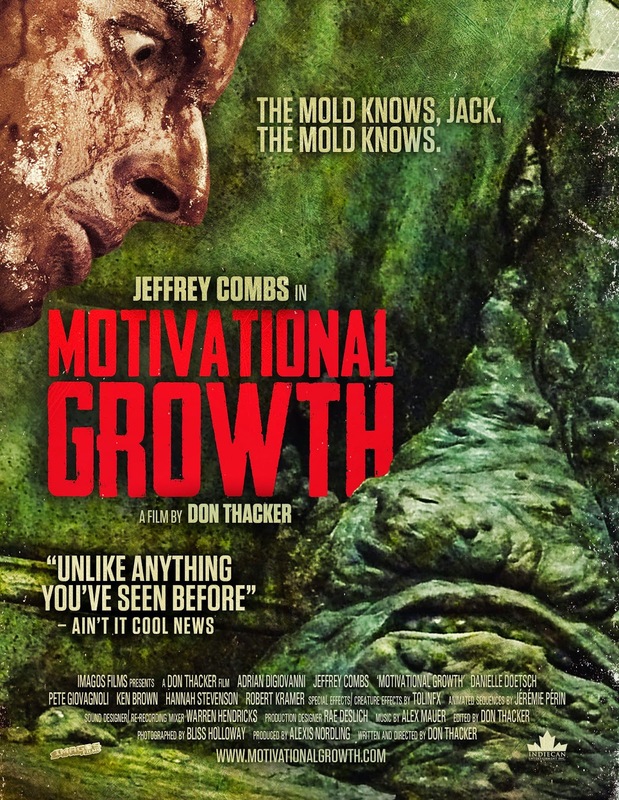 That's not to say that Motivational Growth isn't a remarkably unique movie in its own right, though. Thacker litters the movie with colorful and bizarre visitors to Ian's apartment, which is convenient since the narrative never ventures outside of Ian's own surreal environment. 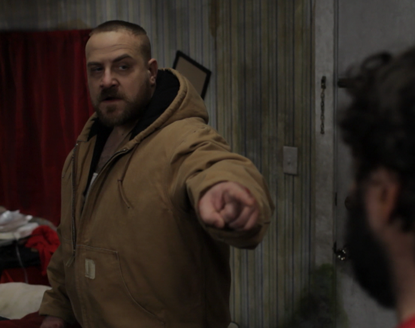 In particular, actor Pete Giovagnoli makes an impression as Ian's cartoonishly aggressive landlord Box the Ox. It's interesting to note that Giovagnoli is far smaller and less physically imposing than the character he plays. Thacker details in the movie's commentary how he used forced perspective and a number of other filmmaking tricks to create the illusion of a towering bully. To Thacker's credit, the viewer almost certainly wouldn't notice the deception without being told, which is a testament to the value of good old-fashioned filmmaking ingenuity. Thacker also keeps the camera moving throughout, indulging in a number of odd angles and trick shots to maintain visual interest despite the confined setting. Motivational Growth never feels small, which is an impressive feat given the claustrophobic nature of the narrative. Even the seemingly random details of Ian's filthy apartment prove a triumph of deceptively detailed and intricate set design. As mentioned previously, though, the real triumph of Motivational Growth is the surprisingly human beating heart at its core. What seems on the surface to likely be a hacky one-note B-movie predicated on a single gag and above-the-title stunt casting proves to be far more affecting. Thacker makes it easy to empathize with Ian's struggle to connect meaningfully with another person, and that's a step beyond that many genre movies can't - or perhaps won't - bother to take. Thacker is a filmmaker to watch, and Motivational Growth is a funny, disturbing, and unique gem. Great review, Brandon! ...And not just because the movie co-stars the criminally underrated Jeffrey Combs as "sentient bathroom filth" (although I like that phrase). I need to check this out. Another movie this reminds me of is Bad Milo. I rather enjoyed that one. Motivational Growth would make a fine double feature with Bad Milo, both of which would in turn feel pretty comfy alongside anything by Henenlotter. Practical FX beasties are too rare a commodity these days. The flick had a great commentary, too. I'm usually not all that interested in commentaries, but I had just enough lingering questions on this one to give it a listen. Combs was clearly tickled by the end result. I gather most of his voice work was recorded separately. HOLY HELL!!! HOW HAVE I MISSED THIS FILM? I am going to have to check this out ASAP because this sounds right up my alley! Anytime you've got sentient mold creatures growing in someone's apartment, I'm there! This premise sort of reminds me of a segment of an anthology flick from 1991 called With Friends Like These.... in which a dude has a mold monster growing in his fridge. It's kinda kooky but I thought it was fun! I think this movie, Bad Milo, and a few Henenlotter movies are going to be a program schedule for a Dog Farm live event at some point. That would be a fantastic themed weekend! That sounds like a pretty damn solid program schedule! I'm actually in the process of looking for a venue to host a Midnight Cinephile movie event. No idea what I'm doing....but that's usually how I like to roll....flying by the seat of my pants and making it up as I go along!